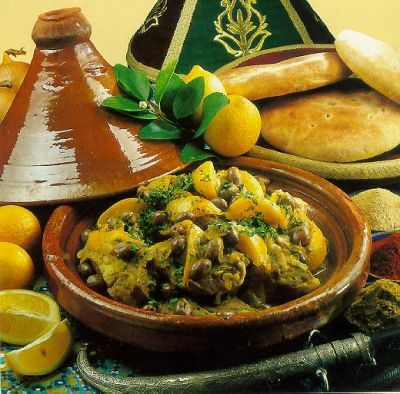 Welcome to Moroccan Food, one of the world’s most famous and delicious cuisines. Moroccan cooking is influenced by a rich and diverse North African history. With dishes ranging from surprisingly simple to intriguingly complex, Moroccan recipes are sure to please a wide range of palates. Browse the topics below to learn more about the traditions, culture and essentials of Moroccan cooking. 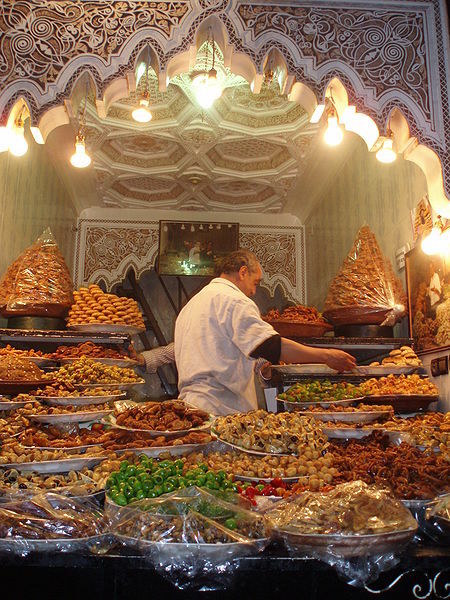 Morocco produces a large range of Mediterranean fruits and vegetables and even some tropical ones. Common meats include mutton and lamb, beef, chicken, camel, rabbit and seafood, which serve as a base for the cuisine. Characteristic flavourings include lemon pickle, cold-pressed, unrefined olive oil and dried fruits. It is also known for being far more heavily spiced than Middle Eastern Cuisine. 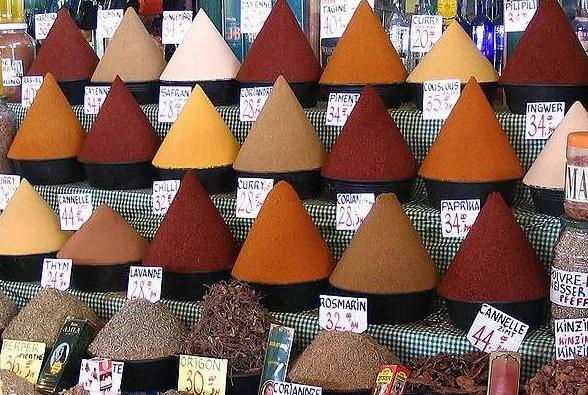 Spices are used extensively in Moroccan food. While spices have been imported to Morocco for thousands of years, many ingredients, like saffron from Tiliouine, mint and olives from Meknes, and oranges and lemons from Fez, are home-grown. Common spices include karfa (cinnamon), kamoun (cumin), kharkoum (turmeric), skinjbir (ginger), libzar (pepper), tahmira (paprika), anise seed, sesame seeds, qesbour (coriander), maadnous (parsley), zaafran beldi (saffron) and mint. Couscous has become an international word known by so many people all over the globe. It is pronounced (KUSKUS).It is , in fact, a traditional Moroccan food .it dates back to the 13th century when the Arabs were occupying the Andalusia ,which is historically speaking , is the south of Spain now. Now you can find couscous in North Africa and even in Europe and USA. It is served in many restaurants around the world. Tajines in Moroccan cuisine are slow-cooked stews braised at low temperatures, resulting in tender meat with aromatic vegetables and sauce. 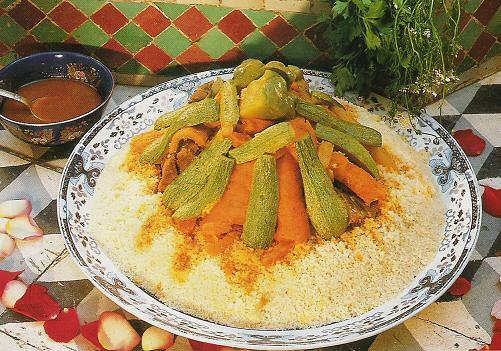 They are traditionally cooked in the tajine pot, whose cover has a knob-like handle at its top to facilitate removal. While simmering, the cover can be lifted off without the aid of a mitten, enabling the cook to inspect the main ingredients, add vegetables, mix the contents, or add additional braising liquid. 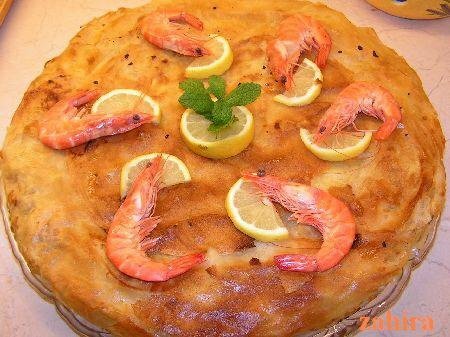 With Chicken: A triple layered savory pastry: A layer of chicken is covered with a layer of eggs and a lemony-onion sauce and then topped with a layer of crushed almonds. Everything is wrapped in phyllo pastry and delicately covered with cinnamon and sugar. 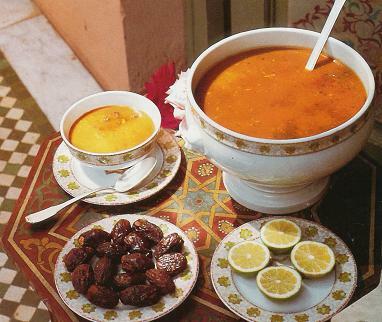 This traditionally Berber soup is usually served during the holy festival month of Ramadan. Also great for cold weather! 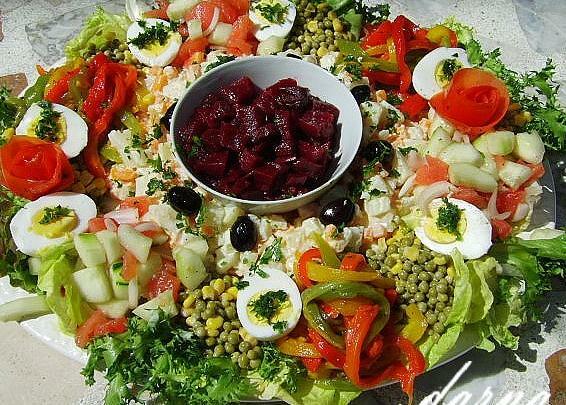 Salads include both raw and cooked ingredients, served either hot or cold. Cold salads include zaalouk, an eggplant and tomato mixture, and taktouka (a mixture of tomatoes, green peppers, garlic and spices). Usually, seasonal fruits rather than cooked desserts are served at the close of a meal. 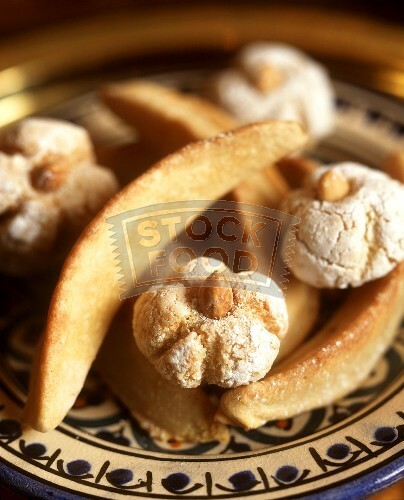 A common dessert is kaab el ghzal (“gazelle’s horns”), a pastry stuffed with almond paste and topped with sugar. Another is ” Halwa shebakia “, pretzel-shaped dough deep-fried, dipped into a hot pot of honey and sprinkled with sesame seeds. Halwa Shebakia are cookies eaten during the month of Ramadan. Coconut fudge cakes, ‘Zucre Coco’, are popular also. The most popular drink is green tea with mint. Traditionally, making good mint tea in Morocco is considered an art form and the drinking of it with friends and family is one of the important rituals of the day. The pouring technique is as crucial as the quality of the tea itself. Moroccan tea pots have long, curved pouring spouts and this allows the tea to be poured evenly into tiny glasses from a height. For the best taste, glasses are filled in two stages. 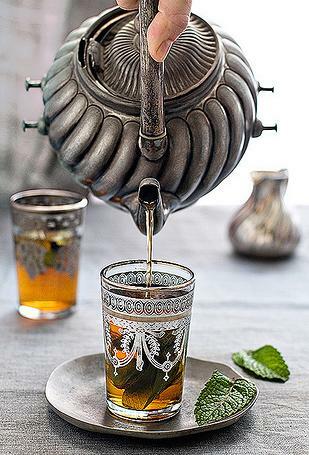 The Moroccans traditionally like tea with bubbles, so while pouring they hold the teapot high above the glasses. Finally, the tea is accompanied with hard sugar cones or lumps. best food in the world ever.